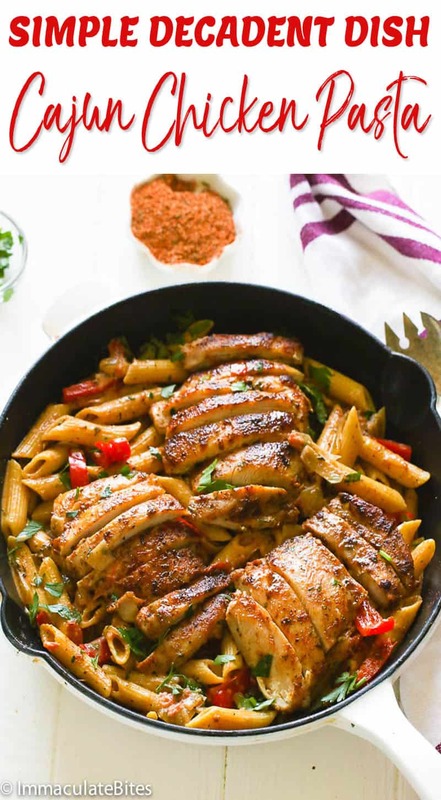 Cajun Chicken Pasta – spicy, cajun-flavored chicken tossed into creamy melt-in-your-mouth alfredo sauce with pasta. 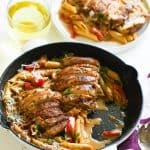 Super easy to make with amazing flavors that’s perfect for family weeknight dinners or get together! 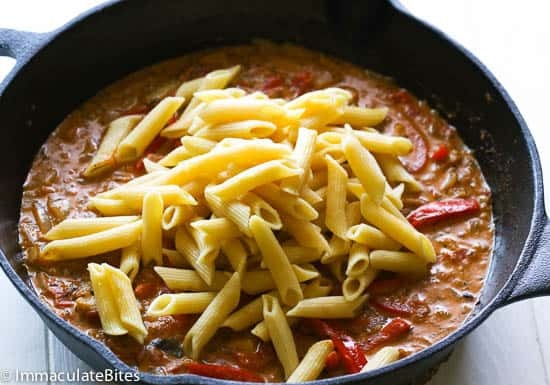 Pasta is a staple in most households , especially those with kids . It’s one of those meals that always gets them to the table , in less than no time . So when pasta is on sale , I stock up on it. Oh Yess! That’s the way to go . The frugal in me doesn’t seem to agree in paying full price for pasta. 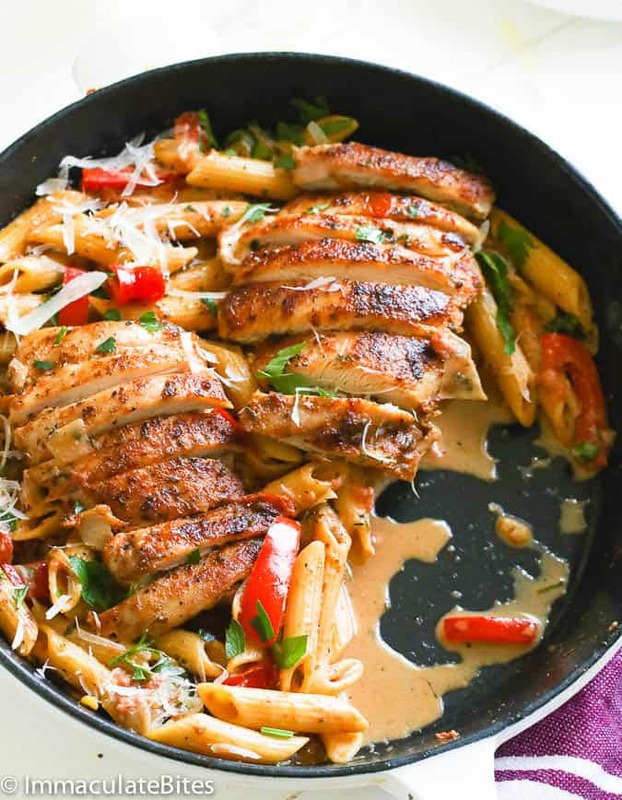 And when you have easy access to pasta combined with one of the best protein in the world for son – chicken – you’ll have a heavenly meal experience right on the table. No need to go to those fancy schmancy restaurant! Talking about “saving”, eh? Now, my little man came home from his first day of school looking forward for his play time (as if he never had enough of those). At an early age, he seems to already know what to have on his plate, like a grown up diner who immediately knows what to order even before looking at the menu. And so he requested a pasta and chicken for dinner. Well, this Mama here got a little bit creative and stray away from the usual pasta and meatballs combo we always have. Instead, I whipped up this juicy Cajun-flavored chicken smothered with a light creamy pasta alfredo sauce. 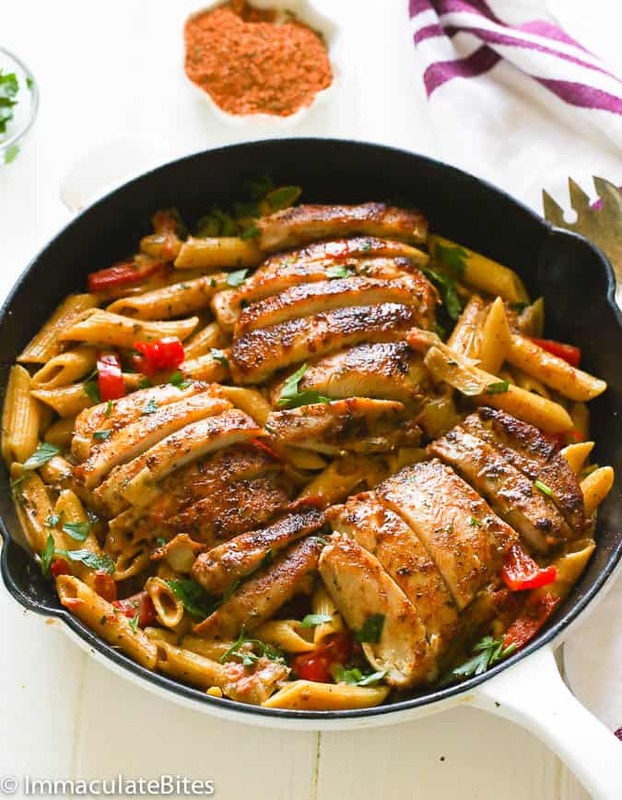 This Cajun Chicken Pasta has been our new favorite lately! And my” two favorite guys dig on it so heartily, that they even have it scheduled again on this week’s menu. And am not complaining , cause it’s easy to whip up. Annd, there’s sooo much to love in this new recipe. 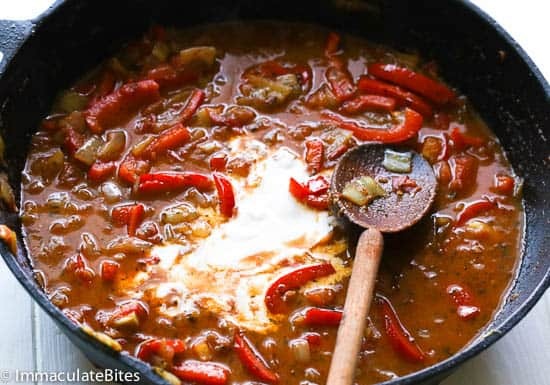 The creamy texture of the sauce complemented so well with the heat of the Cajun spice. Of course, if you’re serving it to the kids, you can adjust the heat so as not to overwhelm their taste buds. But that extra kick in there is a gem! 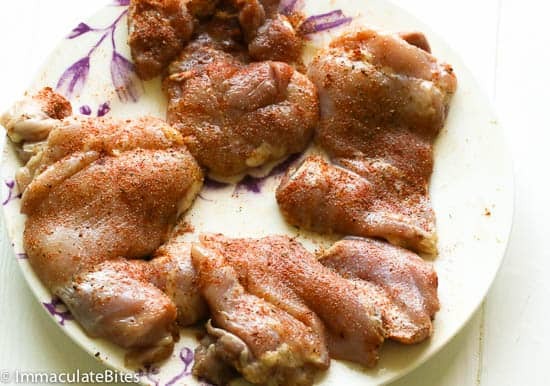 Here, the chicken thighs( you may use breast) are smothered in Cajun seasoning and sauteed to blend in the flavor well into the chicken. Once it’s cooked, you can set it aside and work on the sauce. Topped it with parmesan, and you’ll definitely come reaching for a glass of wine. Sounds like a dinner date? Nah! But you may prep this too if you’d like to save some few bucks instead of taking your date out. And they’ll think you slaved it the kitchen just for them. 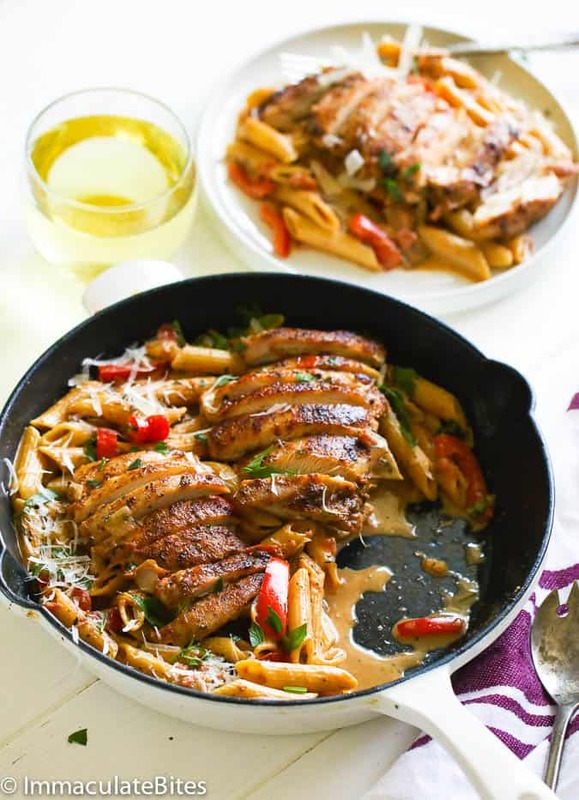 This super easy and flavorful dish will be on our weekly family dinner menu, again next week. 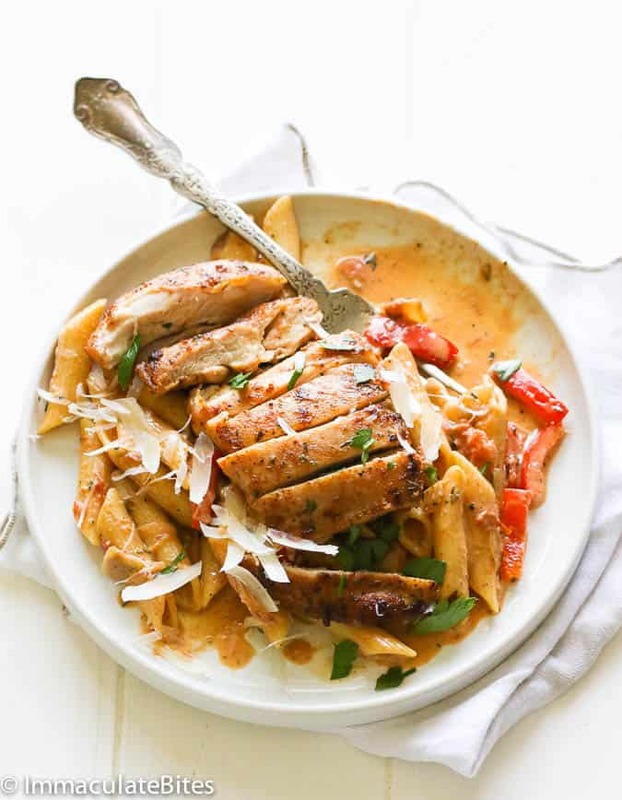 It comes together in no time and yields with contrasting yet complementing flavors – just how I want my pasta to be. I promise that you and your family would surely love this. Don’t forget the garlic bread; it goes well with this satisfying meal. If you’re cooking in a big batch and want it served warm for the next meal, just reheat it on stove and add a little milk and chicken broth to keep it creamy. Your chicken is fully cooked when it is 160° Fahrenheit (74°C). It is dangerous to eat chicken lower than the stated temperature. 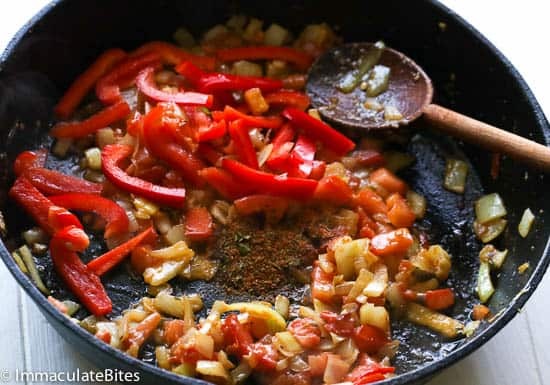 To be on the safe side you may cut up chicken into bite size pieces before cooking. It cooks faster. Adjust heavy cream to desired thickness. I use about ¼ cup to cut down on calories – it’s less creamy with same great results. Go with ½ cup or more for creamy pasta. You may omit completely and replace with an extra tomatoes. 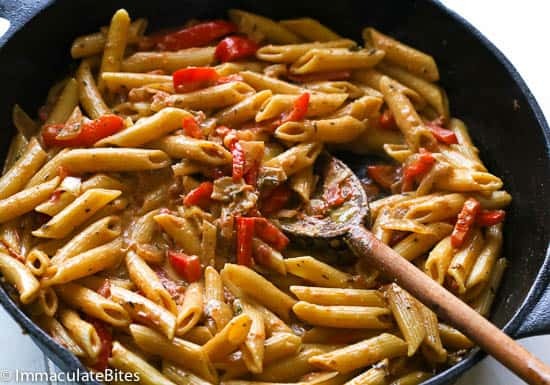 I’ve tried this recipe with couple of different pasta but nothing beats Penne pasta. It’s cylinder shape and ridges does the job of holding the sauce well. Salt according to taste . Then generously season the chicken with creole cajun spice. Heat oil over medium heat in a heavy bottomed Dutch. 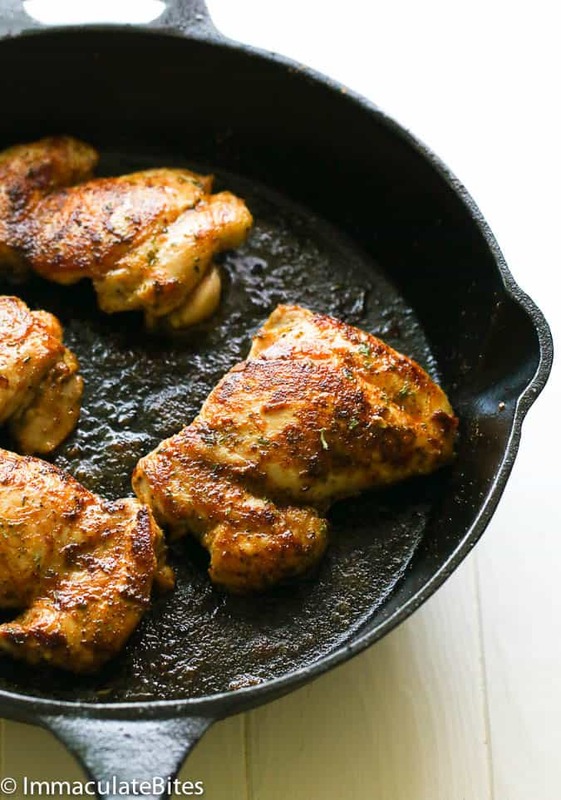 Pan cook chicken for about 8-10 minutes on each side or until fully cooked through and juice from the chicken runs clear. set aside. Mixed pasta or fettuccine . And toss with sliced chicken or serve with chicken on top. Sprinkle with parsley and/or Parmesan cheese. 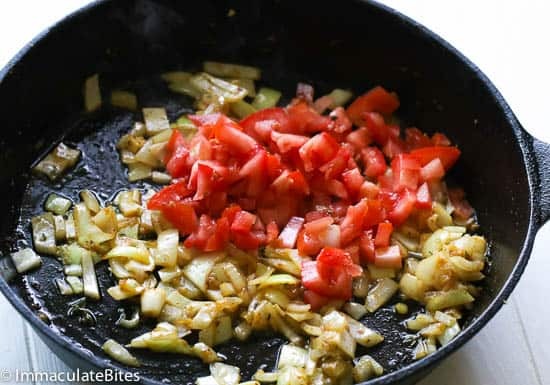 To be on the safe side you may cut up chicken into bite size pieces before cooking . It cooks faster. Adjust heavy cream to desired thickness. I use about ¼ cup to cut down on calories - it’s less creamy with same great results. Go with ½ cup or more for creamy pasta. You may omit completely and replace with an extra tomatoes. This recipe is great. Couple of things i do different is use 300ml heavy cream and about 150ml flour and milk mixed and added at the same tome as the cream to give it extra thickness. And rather than chopped tomatoes, try adding whole cherry tomatoes a couple of minutes before you serve. Great recipe as it is though! How would I make home made Cajun spice? This was absolutely amazing! I added shrimp and andouille sausage and I’m already dreaming about leftovers. Thank you for sharing!! I just stumbled upon this recipe last week and made this today. This was SO GOOD! Tasted like restaurant quality! I ate so much of it, because I couldn’t stop eating it! I’m saving this to add to my current dinner rotations! Great job on this and thank you so much for sharing this recipe !! I just made this for my family and it turned out great! I did omit the tomatoes completely and I used beef smoked sausage. I also added a bit of pesto, cayenne pepper, and Cajun seasoning to taste to the dish. YaY! Thank you so much for your detailed feedback . So glad to hear it worked out well for you. I just made this dish and it was off the charts . Iam definitely gonna make it again easy peasy. I just wished i could have made a much thicker sauce , it was packing the heat. Thanks and iam up for some new recipes from you. Yay! Maybe next time reduce the creole seasoning . Or add more cream. Just tried this recipe sooo soo good! New favorite cajun recipe! thank you so much, your an amazing cook. Aww thanks Ana! Glad it worked out well for you. Made this a few days ago and was really good. Thanks. I usually don’t leave comments but I made this today today and it was perfect! My family likes spice so I added cayenne and red pepper flakes. My dad doesn’t like “creamy sauces” but I snuck the heavy cream and he didn’t even know . It’s just enough but not too much ! Am honored Bella! Thank you so much !!! Made this meal today! My boyfriend and i really enjoyed it. I’m lactose intolerant so i used dairy free single cream and it still tasted lovely. 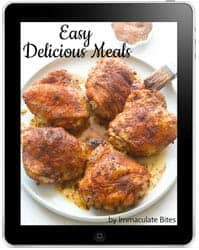 Will definitely be trying out other recipes from you! Thank you for sharing! My pleasure! So glad to hear it worked out well for you Ruth. Thank you so much! I have updated it Kelsey! It’s 340 grams . I know what you mean, it makes it easier if you are measuring . Yeah! Always thrilled to hear it ‘s a hit with the little ones – aren’t they such picky eaters ? Mine is… And when he enjoys something new am overly excited . Thank so much Denise! Hahaha! Thanks Girl! Give it a try you are going to love it even more. This looks so good and I can’t wait to try it! My daughter is sensitive to spice, but I love things HOT! Do you have any tips for making a recipe like this work for both of us? Absolutely ! 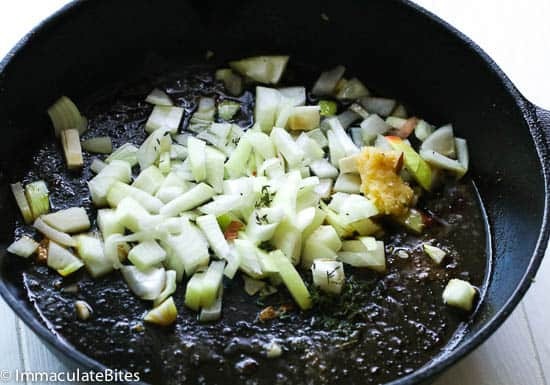 This dish can be really spicy if you use store-bought cajun seasoning, as reported by another reader. To make it less spicy go with my homemade cajun seasoning and omit the cayenne pepper COMPlETElY. You can always add hot sauce on your plate, if you want more heat. what type of hot sauce would you recommenced to use on a recipe like this to make it spicy at the end? The dish was very flavorful but OMG watch out for the cajun spice. I used brand name Slap Your Mama an boy was it HOT! For my own taste and husband’s I’m reducing the cajun spice to 1 teaspoon. Maybe this one was quite potent, but I had to strain half the sauce and add straight half & half…still that didn’t cut it. Strained again and added 1/2 bottle of alfredo sauce. Next night, boy…it’s still a spicy dish! Oh My! Sorry to hear about the spice ! Store-bought cajun spice is usually loaded with cayenne pepper. Homemade is best , cause you can control what goes in. More spice and less heat. Thanks for the feedback. Thank-you, Can’t wait to try this! When should i add the worcestershire sauce? After the cajun spice . Thanks! Thanks, I saw it after I posted that question.. smh. So, excited to make it that I almost didn’t pay attention to the instructions.. lol.. My wife and I enjoyed the meal! Can’t wait to make it again along with other receipts on the site! By the way what part of African is your food base on? I ask because I’m from Ghana and there are not of sites like this. So, we really appreciate your work!